You’ve been training hard all winter and you’ve followed your plan to the letter. Your early season B races are coming up soon but your A races aren’t for months. So how do you make sure you put in a good performance now and show the world how hard you’ve been working all winter? Traditionally, winter base training has involved spending long amounts of time at a low intensity, often below 60 percent of your Functional Threshold Power (FTP) for cycling and 70 percent of your Lactate Threshold Heart Rate (LTHR) for running. This can work for full time athletes who have 40 hours a week to spend training, but the more time crunched athlete should consider if this approach is a wise one. When spending your training time at these low intensities for too long, there is a very strong chance you will in fact be losing fitness and aerobic conditioning. Whilst it’s important to have an off season and reset for the following year, it’s just not necessary to completely back off altogether for months at a time. A good winter of base training should include long steady miles. These miles build your aerobic base and ability to cope with the volume of high intensity sessions that you’ll be adding later. These miles should include a moderate amount of time spent at 75 percent to 90 percent of your FTP, typically known as ‘Tempo’ or ‘Zone 3’. For most of us, now is the time of year to start moving from your winter base plan to the start of your build phase. This next phase of the year should focus on progressively building the time you can hold your FTP for cycling and LTHR for running. Here is an example of a cycling workout designed to help you progress from low intensity to high without burning out too soon. Complete 2 x 16 minute efforts. These efforts should be done as 2 minutes at 95 percent FTP followed by 2 minutes at 105 percent FTP then repeat this until the end of the 16 minutes. Take 8 minutes recovery in-between the efforts pedaling easy with a low resistance. 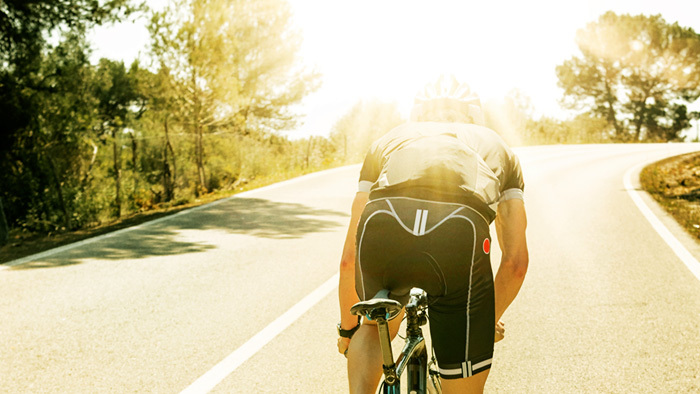 To cool down, take a full 10 minutes to slowly bring the power down to 60 percent of FTP. This is a popular workout to help your body begin to deal with the stress of accumulating higher levels of blood lactate and flushing out the byproducts of hard exercise without stopping completely. Over the course of a few weeks, you may want to start building up this session to include some short intense efforts in-between the two main blocks. This could include 3 x 1 minute efforts at 110 percent FTP with 1 minute recovery in-between. Make sure you extend your rest periods on either side of this extra block so that you can complete the entire session with good quality. If you’ve just come back from an early season training camp, you might feel ready for the season and be tempted to jump straight into your hardest workouts to test your legs. Going straight into a lactate tolerance phase too soon could mean peaking in six weeks time with another four months of racing still left to go. Be sensible and test your legs with maximum efforts once in awhile, not three times a week. Resetting your FTP with a test every six weeks is a great time to get that much desired maximum effort. Converting your winter base training into race results is high on everyone’s agenda. However, you should not lose sight of your main goal of the year. B races are lower priority races for a reason. You want to perform but you’re not expecting an all-time Personal Best. Set a realistic target pace and push on if you feel good going into the final stages of the race. Hitting realistic performance goals and building your confidence throughout the season will help you find your peak fitness at the right time. It will also build your mental strength and give you confidence to race harder and push your limits when it counts. If you haven’t been able to put in the winter miles that you wanted to then don’t be tempted to panic train. It’s never too late to start building your base fitness. Start by testing your current FTP. If you don’t have the facility to do this, then contact your local cycling or triathlon coach for some advice. Once you have an accurate FTP reading then you can begin training accurately. An eight week block of consistent training that progressively builds time spent just beneath your FTP, without spending too much time over it, should deliver long lasting fitness gains. Leave the more intense, lactate tolerance sessions until closer to your A race. You’ve put in the hard work over the winter, now is the time to transition that fitness into the speed that you’ll need on race day. Setting realistic goals, performing your high intensity workouts later, progressively add training load, and taking time to build your aerobic engine will allow you to make the most of your winter training. Ken Buckley is Head Coach and Founder of Buckley Performance Coaching. He is also the British Land Speed Record Holder for human powered vehicles. At the 2015 Human Powered Speed Challenge Ken set a new British record of 75.03mph as part of the University of Liverpool's Arion1 Project. He has a long history in endurance sports having been part of the GB Rowing Team, has raced in Ironman Triathlons and now competes in cycling road races. He has a passion for coaching and loves to help people get on their bikes and ride faster.